What if they made a comedy and nobody laughed? We don't have to ask, because Bad Medicine exists. 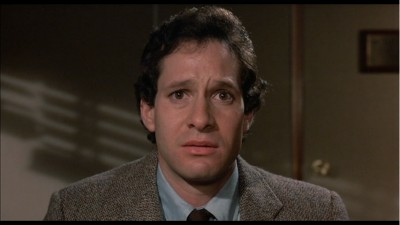 Ostensibly a comedic film, it follows Jeff (Steve Guttenberg), a ne'er-do-well unable to get into any medical school in America, making him the black sheep of his family of doctors. His disappointed father however gets him into a second-rate med school in Central America, where he makes friends with his fellow Americans, including potential love interest/bookworm Liz (Julie Haggerty), and makes foes with the locals, including a harsh overseer (Gilbert Gottfried) and the school's president, Dr. Medera (Alan Arkin). 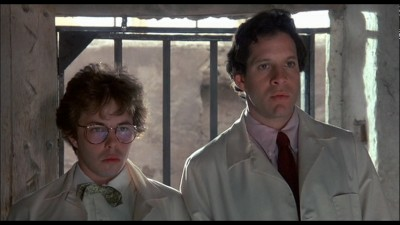 Armed with a smart mouth, it's Guttenberg against the system. At first it feels like it's going to be a classic college comedy, with students-against-administration hijinks set in a med school, while also mixing in culture-clash comedy by placing these white Americans in the middle of Latin America. And that happens, to a degree, but when our heroes pay a visit to a poor village deprived of medical treatment (as a public relations gambit on the part of the school), their guilt and/or desire to help others kicks in, leading them to set up an illegal clinic for the villagers, using supplies stolen from the school. Naturally, this puts them on a collision course with Dr. Madera and his staff. The cast here is like an all-star team of ‘80s comic actors, starting with Mahoney himself, a.k.a. Guttenberg, who's supported by his fellow students, played by Revenge of the Nerds's Curtis Armstrong, Airplane's Haggerty, Fast Times at Ridgemont High's Robert Romanus and TV veteran Julie Kavner, not to mention the locals played by Arkin, Gottfried and the late, great Taylor Negron. Watching this outstanding group try to fight their way through a comedy without jokes is such a massive downer, because you know how funny they could have been with the right story and script. It's so unfunny that one assumes this film is an early effort in their careers, predating the stars' later comedy triumphs, but in every case this film is further down their resumes, which makes it all the more puzzling what in blue blazes happened here. The only part that actually gets some laughs, aside from some of Arkin's more absurd lines, is Madera's America-obsessed secretary (Candi Milo), who has the funniest moment in the movie when she puts the English she learned by reading Romance novels to good use in ravishing Jeff. Other than that, it's a lot of very funny people trying to be earnest, but coming up way short of the mark, betrayed by just about everything around them. The film tries to have it both way, throwing weak jokes around (mostly by Arkin, whose role seems to be part cartoon) and then stopping the proceedings to make a point about privilege or expectations or racism. If you're going to try such bold swings of tone, you have to earn it, and this movie, which starts off as a proto-How I Got Into College before pretending to be M.A.S.H., didn't earn a drop of it. This Manufactured on Demand film arrives on one DVD-R, which comes in a standard keepcase. The disc has a static full-frame menu offering the option to play the film or watch the extra. There are no audio options, no subtitles and no closed captioning. Aside from looking a bit muted in terms of the saturation, particularly during interior scenes, the anamorphic widescreen transfer is rather impressive, with a clean, reasonably sharp image that offers vibrant color (where appropriate, as seen in Gottfried's red jacket), solid black levels, an impressive level of fine detail, and an even layer of grain. There's some ringing in spots, but it's not egregious, nor are compression artifacts. Dirt and damage is similarly quite limited, which is rather surprising considering the film's low profile and age. It's a rather quality presentation. The audio is presented via a Dolby Digital 2.0 track, which offers a fine mix, maintaining good separation between the music, dialogue and sound effects. There's a weird, slight, metallic echo in a few scenes, but for the most part the center-balanced audio is free of distortion, making for a clean listen. The only extra is the film's trailer (1:23), a standard, if utterly misleading 4:3-presented ‘80s promo, the kind Community parodied perfectly with their trailer for Koogler. From the moment you hear that electric guitar and that deep voice, you know you're in for a good time (which is actually not true at all.) Selling the hell out this film as a wacky fish-out-of-water comedy, it even has the hard out with a music sting. Ahh, the ‘80s. An unfunny comedy that morphs into a pointless drama. 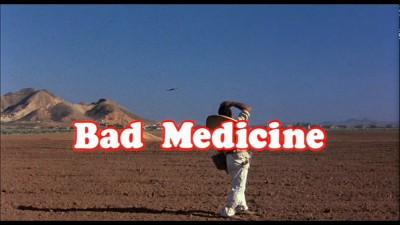 Bad Medicine wastes a solid cast on a film that fails to engage at every turn, despite a set-up that could have resulted in a cult classic. The presentation is actually quite good, though there is only extra, making your decision to look elsewhere for your ‘80s comedy fix an easy one.